Justin Bieber’s Hair Sells For $40,000 On Ebay! Justin Bieber recently got his famous sideswept locks cut and donated the shorn hair to certain outlets for charity. 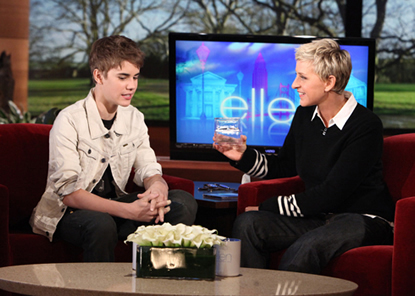 The bit of hair that he gave Ellen DeGeneres was placed on eBay for the charity The Gentle Barn. The auction ended earlier this morning and racked up a ginormous total of $40668.00 in money! Wow, doesn’t that just make you hate life??? This kid cuts off his hair for charity and that in itself ends up earning more than you or I could in an entire year! Wow, good on them for using the hair opportunity to raise that much money for charity!!! At least he’s doing something good with his fame. Maybe he should shave his head bald next time and donate all of it? Will We See A Britney Spears & Justin Bieber Duet?